The meaning of life is to live a life of meaning! 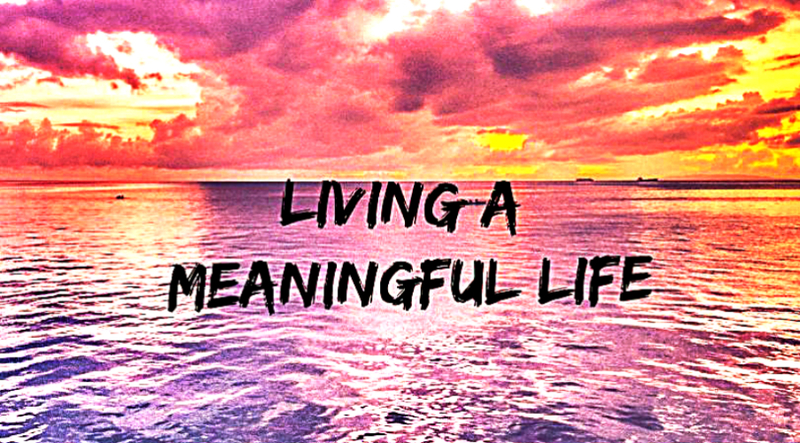 Do you live a meaningful life? Do you wake up in the mornings full with sanguinity and excitement? If yes, than bravo. You are not like most people. Most people wish to live a life that makes them excited. They look at celebrities and they fantasize how their life would be if they lived such lives. But this comes from the lack of excitement in their own lives, and the lack of excitement comes from the lack of meaning. People look for meaning everywhere. In movies, in other people’s lives, in books, love, spirituality. But the truth is, meaning is something you create, not a substance you find. That’s why people live without meaning, because the last place they look for meaning is within themselves. And that’s where meaning is being created. 1. Define what meaningful life is to you. Most people dream about living a meaningful life but they don’t even know what living a meaningful life is. The truth is, there is no objective meaning out there in the world we need to find, as far as we know. We, humans, are meaning making machines. So before you do anything else you should define what living a meaningful life is to you, how would you define it. Discover what has meaning to you, what matters to you. It’s much easier when you know what to chase. If you cannot find a meaning, create one. You give meaning to things. So give meaning to things that excite you and chase them. You’ll wake up much more excited in the mornings. Most people don’t live a meaningful life because they have no idea what matters to them. And how can they know? They don’t even know who they are. Connecting with the deepest parts of yourself is blocked by fears, past traumas, old wounds. You need to face all these things to be able to be with yourself, alone, without distractions and know who you really are. It might seem like a simple journey, the one within, but it’s a long one. However, it’s the most important one you can take. When you know yourself you will know what gives meaning to your life. And knowing this you will be free to shape your life around it. 3. Eliminate unimportant time wasters. Even if you know what has meaning to you, what matters the most, what your soul purpose is, and you spend your time and energy to unimportant things, it’s irrelevant. You are responsible for your time and energy. You are responsible where you invest them. Wherever you invest them in that direction your life will grow. If you invest them toward things that are unimportant, than your life will grow to seem meaningless and without a substance. There are countless distractions in our modern times that it’s really hard to keep your attention unfazed on your purpose. However, it’s necessary to invest your time and energy into the things, activities, people that give meaning to your life if you want to live a meaningful life. When people say ‘I want to live a meaningful life!’ they usually imagine some epic action, adventure movie type of living. But that’s just the idea they have about what living a meaningful life is. In reality, there is no definition. It can be something movie like as an action, adventure movie or it can be something as simple as spending time with your kids. That’s why it’s important to forget about the ideas about what living a meaningful life is. Try new things. Experiment. Play. The sole act of trying new things gives meaning. You don’t know what might be the best thing you have done just like you didn’t know your favorite game before you tried it when you were a kid. So try new things. 5. Stop putting too much pressure on yourself. And yeah, be more gentle with yourself. You don’t need to be perfect. You don’t need to live the most perfect life possible. The truth is, buddy, nobody knows what they are doing. Nobody knows with 100% certainty what they really like. So just live. Stop chasing to live a meaningful life and live a life that’s giving you joy and happiness. When others go out and have fun, go with them. If there is a movie you want to watch in the cinema, go watch it. If you want to travel, go. Free yourself from the burden of living a meaningful life. Stop waiting to find out every exact step and just live. You’ll see how meaning will find you once you stop chasing it.